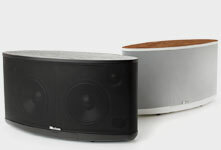 "Speakers all come with various rated frequency ranges and it’s easy to see the change within a brand. For example, one speaker company offers a bookshelf speaker with a frequency range of 55-20,000 Hz, another with a range of 40-20,000 Hz, and some tower speakers with a range of 35-20,000 Hz and even 30-20,000 Hz. So the implication is that as you move up the speaker food chain (within the same brand), the frequency gets lower on the bass end. 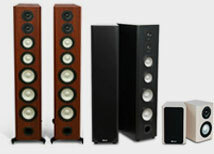 But, some speakers costing a lot more actually have frequency specs that would appear to be much worse! For example, when I look at Infinity, then Axiom, then Paradigm, and then Rockets, I can't see any consistency with the frequency range and the price. How can a speaker with a frequency range of 60-20,000 Hz cost four times as much as a speaker that has a rating of 30-20,000 Hz?" The short answer is that none of these frequency response ranges can be compared, for reasons that will become clear. To get a better idea of frequency response, imagine yourself sitting at the keyboard of a grand piano (don’t worry--you won’t have to practice!). If you push the bottom key on the keyboard, the felt hammer inside the piano strikes the longest string, which then vibrates back and forth 28 times per second (a frequency of 28 Hz). If you then play middle C, pushing the key with the same pressure, and then the uppermost key on the piano (somewhere in the 4,000-Hz range), the resulting tones should emerge from the piano at about the same volume or intensity. If the piano has been finely crafted, we can assume that any key played with the same pressure over the piano’s entire keyboard should emit a sound at a particular frequency at the same volume or amplitude. If one key produced a noticeably softer sound, and another a much louder sound, it would be difficult for the pianist to control the overall effect he or she wanted to create. Now, let’s say we make a recording of every key you played on the piano, using a fine-quality studio microphone that responds equally to all sounds the piano makes. If the microphone has a smooth frequency response--and really good studio mikes do--then the resulting recording, stored on a digital medium or even on a fine Studer analog tape machine, should be an accurate sonic replica of that piano’s sound. Now the big leap: if we play back the digital or analog tape of each piano key being played with the same force, and amplify the electrical signals with a smooth linear amplifier, feeding the output to a theoretically perfect loudspeaker, the speaker would reproduce each piano tone at the same intensity and would sound equally loud to your ear, just like it did in real time when you sat at the piano keyboard. We could then say that our theoretical speaker had a frequency response of 28 Hz to 4,000 Hz, +/- 0 dB, roughly the frequency range of a piano keyboard (more about the dB in a moment). But no speaker is perfect. 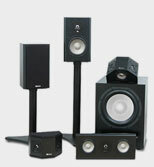 Consequently, some tones may emerge from a given speaker somewhat softer or louder than others. We measure these variations in the speaker’s output--its frequency response--with the decibel (dB), a unit of relative volume, 1 dB being the smallest change in volume that most of us can detect. A difference of 3 dB is quite noticeable. A difference of 10 dB subjectively sounds like "twice as loud," or "half as loud" if, for instance, the speaker’s output dropped by -10 dB at certain frequencies. To cite a specific case, if the Axiom M80 reproduces the sound of the A above middle C at 440 Hz, and a second tone at 3,000 Hz, the two tones will be within, at most, 3 dB of each other in intensity. But if we play the 28 Hz tone, the M80’s output at 28 Hz won’t be as loud. If we measure it in an anechoic chamber, it may be at -6 dB. (The M80’s output at 25 Hz is -9 dB. It’s much harder for woofers to reproduce deep bass as powerfully as midrange frequencies.) Not only that, but our ears are not nearly so sensitive to bass as they are to midrange sounds, so, relatively speaking, the speaker has to work even harder to produce audible bass. 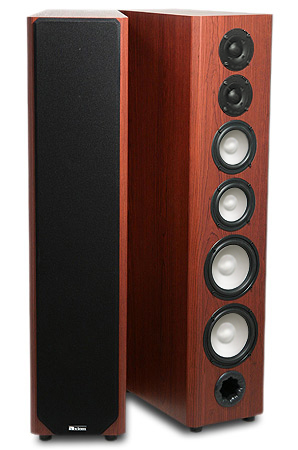 Once placed in a room, a speaker’s deep bass output is helped by "room gain," so the differences aren’t quite so dramatic. A simple claim of frequency response that cites two frequency extremes unqualified by a dB specification (e.g., frequency response: 34 Hz - 22 kHz) is meaningless and useless. It may mean that although the speaker responds at 34 Hz--the cone moves a bit, perhaps--nothing will be audible because the speaker's response at 34 Hz is at -30 dB and inaudible! On the other hand, if Axiom states that the M80’s frequency response is 34 Hz - 22 kHz +/-3 dB, this indicates that every tone that emerges from the M80 will be within 3 dB of any other over that entire frequency range. Moreover, manufacturers often use different methods of measuring frequency response, because there are still no universally accepted standards. That said, reputable companies such as Axiom and some other Canadian builders do careful measurements that are qualified by dB ratings. So to return to the original question, all those figures quoted without the dB qualification are not comparable. You must begin by looking carefully at the extremes and the dB qualification. There may be several different measurements, an anechoic one and a room measurement. You can always assume that the most extreme variation will occur at the lowest bass frequencies, because the most expensive aspect of speaker design is building in deeper and deeper bass output. For example, the M22ti’s response is stated as 60 Hz to 22 kHz, +/-3 dB, whereas the M80’s is 34 Hz - 22 kHz, +/-3 dB. The M80 supplies almost a full octave of deeper bass output than the M22ti, which is why a subwoofer is wonderful addition to extend the M22i’s low-frequency coverage. 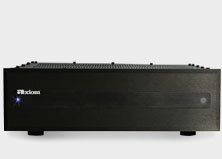 There are, of course, many other reasons why speakers with similar, honestly stated frequency ranges may differ dramatically in price and performance, not the least of which will be determined by the entire family of amplitude response curves that make up the total performance of the speaker. Beyond this are there are the cosmetic and design factors. But that's for another issue of AudioFile.